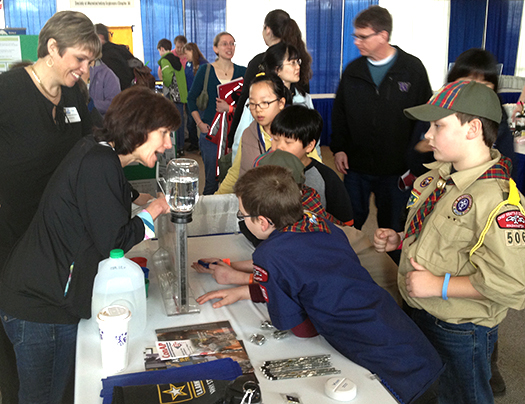 Staff from GeoEngineers took part in the 2013 Engineering Fair on February 9th at Seattle’s Museum of Flight. Principal engineer Dana Carlisle, PE joined senior environmental geologist Rob Leet, PhD, LG and senior hydrogeologist Joel Purdy, LG, LHG in staffing the exhibit sponsored by the Seattle Post of SAME, the Society of American Military Engineers. GeoEngineers is a corporate member of the organization, whose mission includes developing future engineers through outreach and mentoring. Sponsored by the Puget Sound Engineering Council, the annual Engineering Fair was timed to coincide with National Engineers Week, February 17–23. Fair exhibitors from around the Puget Sound area included aerospace, civil, electrical, environmental, geotechnical, industrial, manufacturing, mechanical, military and other engineering specialists who hosted booths and talked to students about what engineers do. Youths who visited the SAME booth experimented with a groundwater flow model as Dana, Rob and Joel explained how human activity can contaminate groundwater and introduced some of the challenges their environmental engineering work involves. “High-school-age students were impressed to learn about the SAME scholarship programs we featured at the booth this year, Dana remarked. “For 2013, the Puget Sound Engineering and Science Scholarship Fund will be awarding scholarships totaling $27,000 on behalf of the SAME Seattle Post.” SAME members also informed students about the SAME engineering camps designed for high school students who excel in math, science and technical courses and are interested in pursuing engineering in college. The Seattle Post pays for three students to attend the camps annually. L to R: Monica Manthey (Herman Miller) and Dana Carlisle (GeoEngineers) explain a groundwater model to an attentive audience.